The foot consists out of 5 metatarsal bones per foot. Every metatarsal bone consists out of three parts: caput ossis metatarsi, corpus ossis metarisi and the basis ossis metatarsi . They form joints with at the proximal side: ossa cuneiformia and at the medial and lateral side the os cuboideum. At the distal side they articulate with the basis of the proximal phalanges. The tarsometatarsal joint is also called the line of Lisfranc. The tarsometatarsal joints have relatively flat articular surfaces and strong, short ligaments who admit small translations and tilting movements. The basis of the os metatarsale 2 is surrounded the three ossae cuneïforme with strong ligaments. The strong dorsal ligament of lisfranc between the lateral side of C1 and the medial side of M2. Lateral is the ligament system with fibers between C2 and M2, just as crossed fibers between C3-M2 and C2-M3. 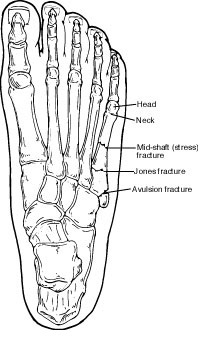 Figure 1: distribution of metatarsal fractures according to their location . Metatarsal fractures are common in the pediatric population, accounting for close to 60% of all pediatric foot fractures. The highest rate of fracture in childhood involves the fifth metatarsal, followed by the third metatarsal. The lowest rate is the first metatarsal. Children under the age of 5 years are more likely to have first metatarsal fractures, with a frequency of isolated first metatarsal fractures of 51%, in contrast to those more than 5 years old, who are more likely to have fifth metatarsal fractures, depending on the age group, a frequency as high as 65%. The next most common fracture finding was a specific combination of second, third and fourth metatarsal fractures . Injury to the metatarsals is common in both acute and chronic settings and they are the most common site of stress fractures in the human skeleton. Among stress fractures of the metatarsal bones, the middle and the distal portions of the corpus ossis metatarsalis II or III are most common. Stress fractures at the base of the first or second metatarsals (or rately other metatarsal bones) are less common. Metatarsal stress fractures are a common occurrence in athletes, particularly in runners, in whom they account for 20% of lower extremity stress fractures. Given the increased stresses experienced by the second and third metatarsals during walking and running, these metatarsals are at greatest risk for stress fracture. Athletes, individuals who are obese, and individuals with osteoporosis or rheumatoid arthritis or diabetes have an increased risk of developing metatarsal fractures. The act of repetitive cyclic loading, especially in the setting of a young athlete or military recruit, can lead to a chronic overloading predisposing one to a stress reaction and ultimately fracture. It has been shown that the fracture pattern and severity of injury vary according to age and mechanism of injury. ( This association can further be correlated with both osseous development and the age-related levels of activity. Most fractures of the corpus ossis metatarsalis are caused by direct blows or twisting forces. 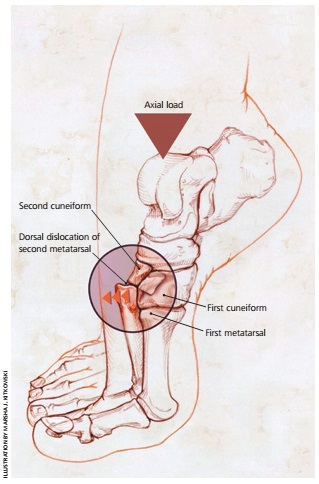 An abrupt increase in activity or chronic overload may cause a stress fracture of the metatarsal corpus. The most common mechanism of injury in fifth metatarsal fractures involves a fall from standing height or an ankle twist with the forefoot fixed. In this position, a pulling force from the lateral cord of the plantar aponeurosis along with tension from the peroneus brevis tendon causes a longitudinal and torsional strain. An avulsion fracture of the fifth metatarsal base (‘tennis fracture’) may occur as a result of inversion injuries to the foot, seen that the base of the fifth metatarsal is the endpoint of the ‘supination fracture line’. A Jones fracture is the most common fracture site and occurs as a result of inversion of the forefoot or from a vertical mediolateral force in the base of the fifth metatarsal, while the patient’s weight is over the lateral aspect of the plantar flexed foot Another cause lies in overuse, repetitive stress, trauma or a sudden change in direction with the heel off the ground . A tuberosity avulsion fracture usually results from ankle inversion while the foot is in plantar flexion. The history often suggests a lateral ankle sprain, and these fractures are often missed. A diaphysial stress fracture is often due to a chronic overloading, especially from jumping and pivoting activities in younger athletes. Fractures of the corpus ossis metatarsalis are generally fatigue fractures and are related to chronic stress. It is the result from repetitive force, as seen in athletes, ballet dancers and soldiers. After all, more force is placed on the second and third metatarsal when walking and gives more stress. Therefore stress fractures and bone remodeling from stress are common in the second or third metatarsal. It also knows a high incidence with military recruits. Fractures from the first through the fourth metatarsals are the kind of fractures that are less common than other metatarsal fractures. They warrant special consideration, because they are often associated with injury to the Lisfranc ligament complex. These crucial ligaments hold the metatarsal bases rigidly in place, maintaining the arch of the foot and anchoring the metatarsals to the rest of the body. Proximal metatarsal fractures are usually caused by crush injuries or direct blows. They may also result from falling forward over a plantar-flexed foot. In athletes, the most common mechanism for a Lisfranc injury is an axial load placed on a plantar-flexed foot. Fracture of the corpus ossis metatarsalis. Fracture of the basis ossis metatarsalis. 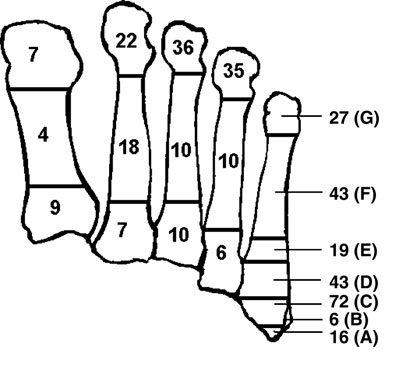 Figure 2: Locations of fracture zones for proximal fifth metatarsal fractures. Three distinct fractures occur in the proximal fifth metatarsal. The joint between the basis ossis metatarsalis IV and V is a key landmark for classifying proximal fifth metatarsal fractures (figure 2). Avulsion fractures: An avulsion fracture on the 5th metatarsal bone is called a ‘dancer’s fracture’. The diaphyseal stress fracture: fracture of the unfused fifth metatarsal base apophysis. Marcher’s fracture: This fracture is also called a fatigue fracture of os metatarsal II and/or III. Further on, there are the fractures from the first through the fourth metatarsals. The most common fracture site is at the base of the fifth metatarsal (Jones fracture) and occurs as a result of inversion of the forefoot. The location of the fracture must be carefully evaluated since the treatment for a Jones fracture is radically different from fractures of the shaft of the fifth metatarsal. Patients with metatarsal fractures complain about pain on ambulation or the impossibility of weight bearing. The forefoot is swollen and tender to palpation. Gross deformities are only seen with complex injury patterns including serial fractures and additional toe dislocations. Fractures from the first through fourth metatarsal: The growth center of the first metatarsal is located proximally in children. It can be misinterpreted as a fracture. Fractures of the proximal fifth metatarsal: Pain in the midfoot zone and one of the following: bone tenderness at the base of the fifth metatarsal, bone tenderness at the navicular and an inability to bear weight both immediately and in the ER for four steps. These are the Ottowa Foot Rules, which determine the need for radiographic evaluation of the foot. Shaft fractures: Typically are pain, swelling, ecchymosis and difficulty walking. In the beginning the pain only occurs with activity. Swelling is often severe, especially if the patient has not elevated the foot. Over the fracture site there is usually point tenderness. Applying an axial load to the head of a fractured metatarsal usually triggers pain at the fracture site. Patients with soft tissue injuries shouldn’t experience pain with this maneuver (figure 3). If the injury is not allowed to heal the pain will become worse, more swelling will appear and even frank fracture may occur. Tuberosity avulsion fracture, Jones fracture and diaphyseal stress fracture:All three fractures cause lateral foot pain and difficulty walking. Acute fractures typically have a sudden onset, with swelling and ecchymosis. Stress fractures usually cause a progressive increase in pain that is worse with activity. Recognizing the gradual onset of symptoms is key to correctly diagnosing fifth metatarsal stress fractures. Radiography may reveal accessory bones or growth plates which may mimic these fractures. Ossicles (small accessory bones) may cause pain in the same region. Stress fractures: Early signs are: pain during activity that goes away with resting and pain over a wide area of the foot. Over time the pain will be present constantly and stronger in one area of the foot. The area of the foot where the fracture is may be tender when you touch it. It might be swollen as well. Figure 3: Axial load mechanism of a Lisfranc injury. A physical exam of the foot along with x-rays and bone scans are used to diagnose metatarsal fractures. When the patient has a typical history and appropriate physical findings, a presumptive clinical diagnosis can be made. Routine X-rays (anteroposterior, lateral and oblique) are usually sufficient to diagnose the fracture. A CT-scan or MRI is used to exclude other injuries when needed. Also a comparison with the other foot may be necessary. When a stress fracture is expected a bone scan may be helpful. Acute metatarsal fracture (fracture corpus ossis metatarsalis) (figure 4): Patients usually present with pain, swelling, echymosis and difficulties with walking. Applying axial load to the head of a fractured metatarsal produces pain at the site. This should not be painful in patients with soft tissue injury alone. Radiographic findings: Fracture position can be assessed by two views that lie at a 90° angle to each other. Oblique or modified lateral views are often more helpful. Fracture lines may not be visible on initial radiographs. In this case the clinical examination and the radiographs should be repeated one to two weeks after the initial injury. Figure 4: Moderately displaced oblique fracture of corpus ossa metatarsalia 5. (B) Oblique vieuw three monts later. 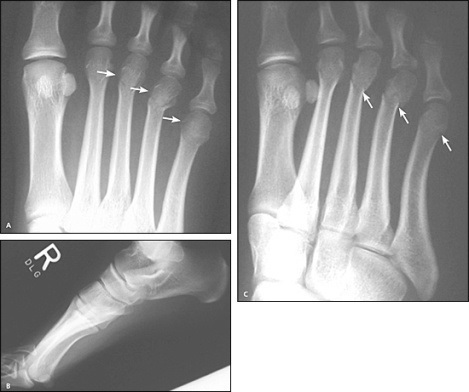 Fractures of the proximal first through fourth metatarsals (figure 5): Radiographic findings: Proximal fractures are generally transverse or oblique and often multiple. In case of Lisfranc ligament injury a standard foot series may be normal in fifty percent of the cases. In this case weight-bearing anteroposterior and lateral radiographs must be obtained: the anteroposterior view demonstrateswidening of the space between the first and second metatarsal heads (stage II or III) with a lost arch height on the lateral view in stage III injuries. Radionuclide bone scan: is extremely accurate for diagnosis in case of stage I injury with clinical suspicion and normal radiography. Figure 5: Nondisplaced fractures of the proximal portions of MT 2 – MT 4. A Fracture of the unfused fifth metatarsal base apophysis is a kind of fracture is typically present in 9- to 14 year-olds. Unlike fractures which occur is this area, the lucent line, associated with an unfused apophysis, is always longitudinally oriented. Comparison radiographs of the contralateral foot are helpful in equivocal cases. 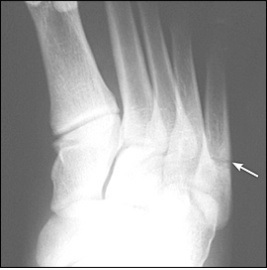 Acute fractures of the proximal fifth diaphysis (figure 6): Using the Ottawa ankle rule we can exclude a lateral ankle sprain from a tuberosity avulsion fracture. When point tenderness is present over the fifth metatarsal and the foot appears to be normal, it could be a sprain or an ankle series. 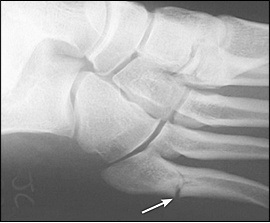 Jones fracture (figure 7): Radiographic findings: Acute fracture of junction between the proximal diaphyse and the corpus ossis metatarsi quinti. The fracture line is sharp and extends into or towards the articulation between MT 4 and MT 5. A jones fracture can be a stress fracture (tiny hairline break that occurs over the time) or an acute (sudden) break. 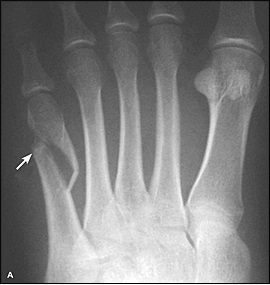 Tuberosity (styloid) fracture (figure 8): Clinical findings: A radiolucency is seen perpendicular to the long axis of the fifth metatarsal. The fracture may be intra-or extraarticular (cuboid-metatarsal articulation) and never extend into the joint between the fourth or fith metatarsal (=different from Jones fractures). This kind of fracture always occurs proximal to the joint of the base of the fourth and fifth metatarsals. It involves the tip of the styloid process at the attachment of the plantar aponeurosis and peroneus brevis. The peroneus brevis tendon has a broad lateral insertion and may contribute to further dislocation . Stress fractures (figure 9): Patients with a typical history and appropriate findings may not need the tests. Radiographic findings: rarely visible on plain radiographs until symptoms have been present for two to six weeks. An MRI or bone scan can confirm the diagnosis. 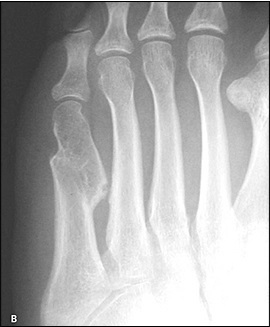 Torg type II stress fracture of the metatarsal diaphysis An early stress fracture will demonstrate cortical thickening, an older stress fracture will demonstrate a widened fracture line and partial or complete obliteration of the medullary canal. Fractures of a single metatarsal shaft with lateral or medial displacement usually heal well without correction. Displacement of more than three to four millimeters displacement in a dorsal or plantar direction or dorsal /plantar angulation exceeds ten degrees do require reduction. Nondisplaced avulsion fractures heal well within thirty to forty days with symptomatic therapy. Stress fractures of the metatarsal shaft usually heal well in case of cessation of the causative activity for four to eight weeks. Rx is used to confirm the fracture and will also be used to show how the fracture evolves. Figure 10: Moderately displaces fracture of the fifth metatarsalshaft. This questionnaire has four domains: pain, function, footwear and general Foot Health. Figure 10: FFI-R Short Form . A neurovascular exam should be performed in every patient with a suspected metatarsal fracture. Applying an axial load to the head of a fractured metatarsal usually produces pain at the fracture site (figure 3). This is done by holding the toe in line with its corresponding metatarsal, and pushing the toe in toward the metatarsal. Sequential palpation may reveal the fracture site. Assessing pain while testing plantar and dorsal flexion of the toes is helpful from differentiating a fracture from a tendon injury. If a fracture is present, direct palpation should produce greater pain than testing tendon function by resisting plantar and dorsiflexion. The same as in acute metatarsal fractures. The key to detecting Lisfranc injury is to maintain a high index of suspicion whenever a patient presents with pain in the area of the Lisfranc ligament. tenderness is present over the fracture site, edema and ecchymosis might be present. When there is a vascular compromise, an open fracture, a compartment syndrome, an associated neurologic deficit of a devitalizing of the skin or the skin is at risk to devitalize there should be an urgent referral. A prompt referral with a displaced fracture of a single metatarsal when it is a shaft fracture near the metatarsal head, a displaced styloid fracture of metatarsal 5, an unacceptable position of shaft fracture. Also with a fracture of the first metatarsal (unless completely non-displaced), tenderness over the Lisfranc ligament so injury can’t be ruled out, multiple metatarsals are fractured, there are unsatisfactory results during the following treatment. A surgical intervention is required when the bones have a disturbed alignment or when they are unlikely to stay in alignment. Surgery will hold the bones in place with plates, screws or similar devices. When a piece of the bone pierces the skin, surgery is required to clean the wound and bone fixation. - first 24 hours: ice and elevation (higher than the heart). Progressive weight bearing. - reduction: under local anesthesia, using a regional or hematoma block. Placing the toes in Chinese finger traps and allowing gravity to accomplish the reduction. Applying light weights or manual traction to the distal tibia is sometimes helpful. The reduction should be maintained in a molded, bivalve, non-weight-bearing cast and postreduction radiographs should be obtained to confirm proper alignment. - Flouoscopy : A K wire is inserted form determination of proper position and length Incision. - Longitidunal incision is made over distal metatarsal. - Local bone graft : Can be obtained from tuberosity and from bone bits from the drill. - Implants :Consider indersertion of cancellous bone screw. 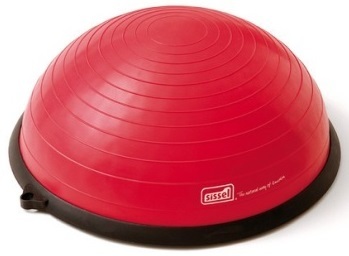 - Post-operative : patients will require protected weight bearing.
! consider early surgical fixation in athletes. This fracture doesn’t heal well, seen that the fracture is localized in a small area of MT 5 which receives less blood. The duration of treatment of a metatarsal fracture depends on the location and type of fracture. The first days are protection, rest, ice, compression and elevation important until the swelling is stabilized.  Initial therapy exercises: focus on little to no weight-bearing on the affected limb as the bones continue to calcify and heal properly. Therapists will introduce manual therapy around the ankle and plantar of the foot to minimize inflammation and pain while also promoting increased ROM within the smaller metatarsal and tarsal joints. Ice needs to be applied to reduce swelling and inflammation. The physical therapist could perform soft tissue massage, joint mobilizations, electrotherapy, hydrotherapy and later on excercises to increase strength, flexibility and balance. The patient should be encouraged to perform active mobilizations: plantar and dorsal flexion of the foot and ankle, inversion and eversion of the foot and ankle (the patient should also do this at home!) .  Mid-therapy exercises: depends on the severity and area of fracture. Promotion of flexion and extension within the ankle: stretching and strengthening exercises. Increased weight-bearing exercises. - Put a weight on a towel, the towel is on the floor and the foot of the patient stands on the towel from the metatarsal joints. 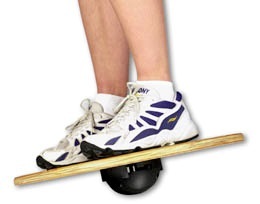 Ask the patient to bring the weight closer only by doing a toeflexion. - Put the patients foot on an Airex pad and ask the patient to claw his toes in the Airex pad (see figure 11). - Let the patient stand on his toes. The patient can do this while sitting on a chair (very low weight-bearing). By letting the patient perform this exercise standing, the weight-bearing is increased.  End therapy and discharge: Patient should be able to have full use of the affects foot an should be able to walk completely unassisted for extended periods. A standard conservative treatment for jones fractures: this treatment is only applied when the bones are not too much dislocated. 1) For 2-3 days in a short leg cast with additional antiphlogistic medication. 2) After edema reduces, the leg cast gets replaced by an adapted Caligamed 11 brace for several weeks, followed by intense mobilization and walking therapy. A standard operative treatment for Jones fractures. 2) If the bone does not cure with a propeller, a bone graft is possible. ↑ PUTZ R, PABST R, Sobotta Atlas of Human Anatomy 14th edition. München (2009): Urban & Fischer. ↑ KAPANDJI IA, Bewegingsleer Deel II De onderste extremiteit. Houten 2009: Bohn Stafleu van Longhum. ↑ FRONTERA WR, Clinical Sports Medicine: Medical Management and Rehabilitation. China (2007): Elsevier Health Sciences. ↑ Cakir H, Van Vlit-Koppert ST, Van Lieshout EM, De Vries MR, Van Der Elst M, Schepers T [Foto]. Demographics and outcome of metatarsal fractures. Archives of Orthopaedic and Trauma Surgery (2011); 131: 241-245. ↑ Cakir H, Van Vlit-Koppert ST, Van Lieshout EM, De Vries MR, Van Der Elst M, Schepers T, Demographics and outcome of metatarsal fractures. Archives of Orthopaedic and Trauma Surgery (2011); 131: 241-245. ↑ Rammelt S, Heineck J, Zwipp H, Metatarsal fractures. Injury 35 (Suppl 2) 2004; SB77-SB86. ↑ Robertson NB, Roocroft JH, Edmonds EW, Childhood metatarsal shaft fractures: treatment outcomes and relative indications for surgical intervention. J Child Orthop 2012; 6:125-129. ↑ Johnson VS, Treatment of fractures of the forefoot in industry. Bateman JE Foot Science (1976); Philadelphia: WB Saunders. ↑ Owen RJ, Hickey FG, Finlay DB, A study of metatarsal fractures in children. Injury 1995; 26(8): 537-538. ↑ Singer G, Cichocki M, Schalamon J et al., A study of metatarsal fractures in children. J Bone Joint Surg Am 2008; 90(4): 772-776. ↑ Holubec KD, Karlin JM, Scurran BL, Retrospective study of fifth metatarsal fractures. J Am Podiatr Med Assoc 1993; 83 (4): 215-222. ↑ Geyer M, Sander-Beuermann A, Wegner U, et al., Stress reactions and stress fractures in the high performance athlete: Causes, diagnosis and therapy. Unfallchirurg (1993); 96: 66-74. ↑ Harrington T, Crichton KJ, Anderson IF, Overuse ballet injury of the base of the second metatarsal: a diagnostic problem. American Journal of Sports Medicine (1993); 21(4): 591-598. ↑ O’ Malley MJ, Hamilton WG, Munyak J et al. Stress fractures at the base of the second metatarsal in ballet dancers. Foot Ankle International Journal (1996); 17: 89-94. ↑ Torg JS, Balduini FC, Zelko RR, et al., Fractures of the base of the fifth metatarsal distal to the tuberosity. Classification and guidelines for non-surgical and surgical management. American Journal of Bone and Joint Surgery (1984); 66: 209-214. ↑ Resnick D, Diagnosis of bone and joint disorder. Philadelphia (1995): saunders; 2580-2596. ↑ Anderson RB, Hunt KJ, McCormick JJ, Management of common sports-related injuries about the foot and ankle. J Am Acad Orthop Surg 2010; 18(9): 546-556. ↑ Wall J, Feller JF, Imaging of stress fractures in runners. Clin Sports Med 2006; 25(4): 781-802. ↑ Zwipp H, Rammelt S, (2002). Frakturen und Luxationen. Orthopädie und Orthopädische Chirurgie. Fuß. Stuttgart, New York: Georg Thieme Verlag: 531—618. ↑ Hellpap W, The neglected lower ankle. The ”fracture“ line of supination. Arch Orthop Unfallchir (1963); 55: 289—300. ↑ Hatch RL, Alsobrook JA, Clugston JR, Diagnosis and Management of Metatarsal Fractures. American Academy of Family Physicians 2007; 76 (6). 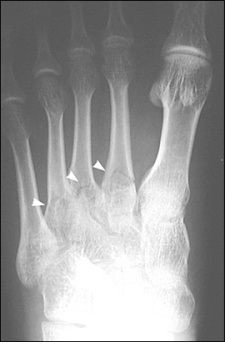 ↑ Ding BC, Weatherall JM, Mroczek KJ et al., Fractures of the proximal fifth metatarsal – Keeping up with the Joneses. Bulletin of the NYU Hospital for Joint Diseases 2012; 70(1): 49-55. ↑ Simons SM, Foot injuries in the runner. In: O’Conner FG, Wilder RP, eds. Textbook of Running Medicine. New York, N.Y.: McGraw-Hill, 2001: 213-26. ↑ Anderson LD. Injuries of the forefoot. Clinical Orthopedics (1977); 122: 18-27. ↑ Dameron TB, Fractures and anatomic variations of the proximal portion of the fifth metatarsal. American Journal of Bone an Joint Surgery (1975); 57(6): 788-792. ↑ . Hellpap W, The neglected lower ankle. The ”fracture“ line of supination. Arch Orthop Unfallchir (1963); 55: 289-300. ↑ Quil GEJ, Fractures of the proximal fifth metatarsal. Orthopedic Clinics of North America (1995); 26: 353-361. ↑ Burge AJ, Gold SL, Potter HG, Imaging of sports-related midfoot and forefoot injuries. Sports Health 2012; 4(6): 518-534. ↑ Kavanaugh JH, Brower TD, Mann RV, The Jones fracture revisited, J Bone Joint Surg Am 1978; 60: 776-82. ↑ Stiell IG, Greenberg GH, McKnight RD, Nair RC, McDowell I, Reardon M, et al., Decision rules for the use of radiography in acute ankle injuries. Refinement and prospective validation. JAMA 1993; 269: 1127-32. ↑ Asal W, Überlastungsschäden am Knochensystem bei Soldaten. Langenbecks Arch Chir (1936); 186: 511-522. ↑ Lehman RC, Torg, JS, Pavlov H, et al., Fractures of the base of the fifth metatarsal distal to the tuberosity: a review. Foot Ankle (1987); 7: 245-252. ↑ Wolfe MW, Uhl TL, Mattacola CG, McCluskey LC, Management of ankle sprains. (Published correction appears in Am Fam Physician 2001; 64:386) Am Fam Physician 2001; 63:93-104. ↑ Rosenberg GA, Sferra JJ, Treatment strategies for acute fractures and nonunions of the proximal fifth metatarsal. Journal of the American Academy of Orthopaedic Surgeons (2000); 8: 332-338. ↑ Burroughs KE, Reimer CD, Fields KB, Lisfranc injury of the foot: a commonly missed diagnosis. Am Fam Physician 1998; 58:118-24. ↑ Lawrence SJ, Botte MJ, Jones’ fractures and related fractures of the proximal fifth metatarsal. Foot Ankle (1993); 14: 358–365. ↑ Budiman-Make, E., Conrad, K., Stuck, R., Matters, M., Theoretical model and Rasch analysis to develop a revised Foot Function Index. Foot & Ankle International, American Orthopaedic Foot & Ankle Society, (27), 519-527.